A Girl Scout can choose between this or the Traditional Membership Pin #09001. It is worn on the Insignia Tab on the left side of the uniform, centered above the heart. 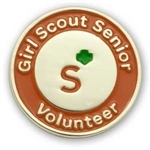 Cadette Girl's Guide to Girl Scouting Goldtone pin with Senior shorthand symbol in center and orange border with "Girl Scout Senior Volunteer." 3/4" round. Butterfly clasp. Imported. Volunteer pins do not have any requirements and volunteers may purchase for themselves.